Date: October 30, 1931; Title of article: "Seen And Heard" by J. A. Dunn. "The first of my ancestors of whom I have any record was William Cloud, who came from Wiltshire, England, to Pennsylvania, in 1862 (sic), and got a grant of land from William Penn. So far as my record shows he was the first Cloud that came to America. He married Elizabeth Bailey in 1865 (sic), and had eight children. One of his sons, Jeremiah, Jr., married Annie Bailey, and to that union a number of children were born. Their youngest son, William, married Mary Pierce in 1739, and they had eight children. Their son, Jesse, married Mary Allen in 1769, and he was the father of several children, of whom I shall name my great grandfather, Joseph Cloud. "Joseph Cloud settled in Stokes county, North Carolina, but I do not know who he married. He came over the mountains into Tennessee in the latter part of the nineteenth century and entered a large tract of land that included what is now Bean Station. Joseph Cloud had several children. His son, Benjamin, married Mary Chadwell about the year 1800, and moved to Hawkins county, where he lived until about 1808. Later he came to Claiborne county and settled on the farm that is better known as the Bob Fugate farm in Mulberry Valley. In 1816 he left his farm and moved to Tazewell. He lived on the corner just opposite the entrance to the Baptist church until 1836, when he moved to Chadwell's Station, Lee county, Va., dying about 1846. "Benjamin Cloud had seven children: Benjamin Franklin, Alexander Moore, Pleasant, Louisiana, Nancy, Bathenia and Betty. Alexander Moore Cloud was a bachelor. He died in 1844. Pleasant died in infancy. Barthenia married the Rev. Josiah Smith and moved to Carthage, Tenn. Louisiana married Jacob Schultz, of Big Sycamore. Schultz moved to Virginia, but his son, B. F. Schultz, came back to Tazewell, married, and remained there until his death. Nancy Cloud married Dr. Shackleford. She died in Tazewell. Betty never married, died comparatively young. "My father, Benjamin Franklin Cloud, was the oldest of the Cloud children. He served two terms as circuit court clerk, but was forced to retire to private life on account of what his physician diagnosed as tuberculosis. He built a home on Cedar Hill and moved there the same year. By adopting a series of deep breathing exercises, he cured himself in two years. It was in 1845 he built his home, which still stands on the hill, and in the fall of 1845 he married Mahuldy Schultz. He was the father of four children: Alexander Moore, Mary, Carrick, Carriger, and Frank. "Alexander M. Cloud, ye humble author, lived at the old homestead. Carrick C., who never married, died several years ago. Mary died at the age of 18, and Frank died in infancy. When the Civil War came on B. F. Cloud was too old to enlist in either army. However, his sympathies were with the South, because he was a slaveholder. Notwithstanding the fact that my father was a Southerner at heart, he would help either a Federal or Confederate soldier to escape if in his power to do so. In 1865 he was called upon to represent Claiborne county in the legislature, and was later elected to the state senate. He died at his home in Tazewell in 1886. "When Tazewell was first settled, what is known as Cedar Hill was then called Bald Hill, because several acres of the summit were barren. The cedars at the foot of the hill were small but very dense, and afforded an excellent hiding place for those who wished to escape the eyes of the public. Doubtless the expression 'hit the bald,' meaning to hide or run from, originated at Tazewell. Sixty years ago when there was a fight or disturbance of any kind at Tazewell, many of the scary negroes would run to the cedars and hide until quiet again reigned. Often, at that time, men would get drunk and threaten to make everybody 'hit the bald,' meaning they would run everybody into the cedars. "William Kirkpatrick and William Epps each built a home in Tazewell the same year my father built his on Cedar Hill. The Epps home is the last dwelling house on the south end of Church street, and the Kirkpatrick house is on the next street that runs just back of the Epps house. They are built on the same architectural lines. Each has two rooms which, by means of double doors, can be converted into one large dancing hall. "William Epps was a merchant in Tazewell. He married a Miss Evans, and they had four children: Edward, Charlie, Sallie and Matilda. Edward married Kate Fugate, and was a partner in the mercantile business with his father. When the latter died, Edward took charge of the store and was the leading merchant of Tazewell until shortly before his death. "William Kirkpatrick married a sister of William Epps' wife, and was the father of four children: James, William, Jane and Ann. James went to Mississippi before he married. Jane taught school at Tazewell for several years and then married Dr. McGee of Morristown. Ann married a young lawyer of Knoxville, or Chattanooga, whose name was McDermit. Soon after their marriage they moved to Knoxville or Bristol. Her husband died, but she is still living. Judge Lon Tyler married her daughter. William Kirkpatrick moved from Tazewell to Morristown." "W. M. Schultz was born in Claiborne county, Tennessee, December 7, 1845. 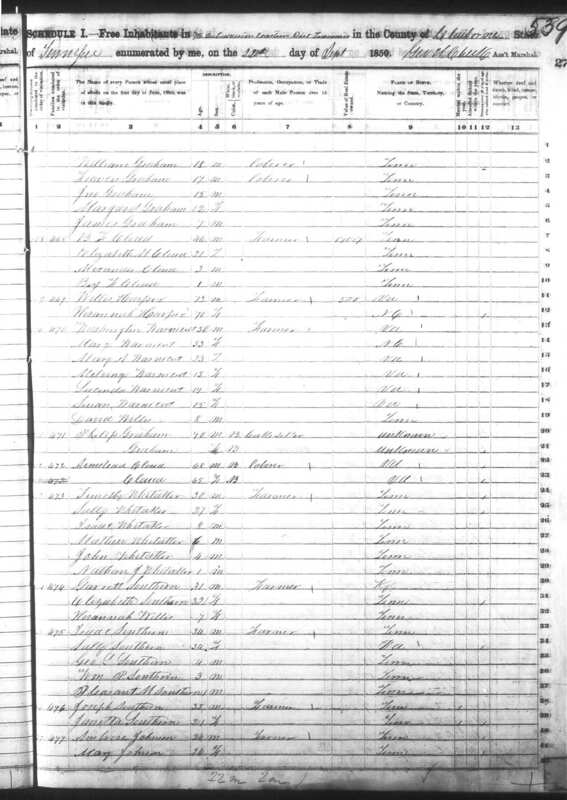 His father--Jacob Schultz--came to this county in 1858, and settled on a large farm two miles southwest of Springfield, where he resided till his death, in 1865.."
Some of the SHACKLEFORD family also came to Greene Co MO. Chances are Alexander M. Cloud was not aware of the final move to Greene Co.
[S1502] Bennett, Imogene, email to Cloud@rmgate.php.indiana.edu of Mar 10 1997.